Goodbye Sabena technics, hello Sabena Aerospace ! Home Miscellaneous Goodbye Sabena technics Brussels, hello Sabena Aerospace ! Goodbye Sabena technics Brussels, hello Sabena Aerospace ! The “Sabena technics Brussels“ company leaves the French group TAT, which had bought it in 2004, three years after the bankruptcy of Sabena, to become an independent company, said Stéphane Burton, CEO of Sabena technics last Thursday. The company, which was taken over via a management buy-out on June 1, 2014, will be renamed Sabena Aerospace from 1 January 2015. Created in 1968 by the establishment of the maintenance department of the former Belgian national airline Sabena into a separate fully-owned company, Sabena technics is a leading independent MRO (Maintenance, Repair and Operations) provider specialized in the maintenance of narrow and widebody aircraft, offering services to civil and military aircraft operators. At Brussels Airport, Sabena technics employs a workforce of more than 400 persons. Here, airframe maintenance is carried out on narrow and wide-body aircraft, as well as component repair and overhaul. The now independent Brussels site benefits from specialised component workshops and a logistics centre. It equally houses the heavy maintenance facility of X-air services, its joint venture with TNT Airways whose main workshop is in Liege. Sabena Aerospace will also have units in Kinshasa (Democratic Republic of Congo) and in Dar es Salaam (Tanzania). The company has a new logo, depicted above, and a motto: “Keep on flying, we take care“. The turnover is around 50 million euros. Belgian Red Lions are back in Belgium with Brussels Airlines, as World Champions! I am particularly happy with that event: I started my professional career at Sabena technics (as it was not yet called in 1966 – it was still the maintenance department of Sabena). It proudly keeps the name Sabena alive in Belgium and elsewhere. 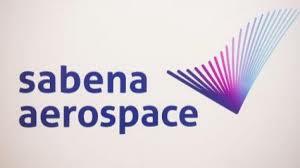 And the logo is written in the special sabena font, last seen on Sabena aircraft.